Very good overall color and hue accuracy, with minor oversaturation of some colors. Saturation. 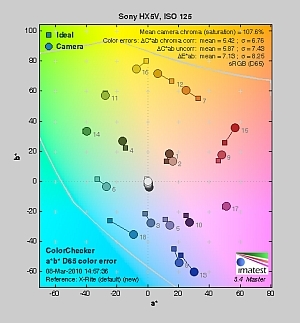 The Sony HX5V produced very good saturation overall, with only minor oversaturation in reds and blues as well as some greens, browns and purples. Some other colors such as cyan and yellow were actually undersaturated by a small amount. Overall, the Sony HX5V's images appeared to have fairly realistic color that didn't look too flat or dull. Most consumer digital cameras produce color that's more highly saturated (more intense) than found in the original subjects. This is simply because most people like their color a bit brighter than life. Skin tones. The Sony HX5V's skin tones looked fairly accurate and should be pleasing to most consumers. Where oversaturation is most problematic is on Caucasian skin tones, as it's very easy for these "memory colors" to be seen as too bright, too pink, too yellow, etc. Hue. The Sony Cyber-shot HX5V produced a few color shifts relative to the correct mathematical translation of colors in its subjects, most visibly pushing cyan towards blue (for better-looking skies), orange toward yellow, and yellow toward green. Still, despite the shifts in red through yellow and cyan, overall hue accuracy was very good. Hue is "what color" the color is. Auto and Incandescent white balance settings were quite warm, but Manual was much more accurate. About average positive exposure compensation required. Color balance indoors under incandescent lighting was quite warm with the Auto and Incandescent white balance settings. The Manual setting produced the most accurate color overall, while being just a touch cool. The Sony HX5V's exposure system handled this lighting well, producing good results with an average amount of exposure compensation, +0.3 EV. Overall color looks good, though the blue flowers look a touch purplish, probably due to the HX5V's tendency to punch up reds a little. (Many digital cameras reproduce the blue flowers here with more of a purplish tint, so the Sony HX5V actually performs a bit better than average here.) Our test lighting for this shot is a mixture of 60 and 100 watt household incandescent bulbs, a pretty yellow light source, but a very common one in typical home settings here in the U.S. Excellent overall performance outdoors. Good color as well. The Sony Cyber-shot HX5V performed very well under harsh outdoor lighting, with far fewer blown highlights or lost shadows than we're used to seeing from a compact camera. Though the shirt is quite bright, only a few highlights in it are actually clipped, as well as a few in the pendant and flowers. There are some dark shadows, but they contain pretty good detail for a digicam. Sony's default Dynamic Range Optimization no doubt has a lot to do with this excellent performance. No exposure compensation was required to keep the model's facial skin tones bright for the outdoor portrait shot (the average for this shot is +0.7 EV), so the Sony HX5V did very well here, too. The outdoor far-field house shot at the default exposure was also well exposed, again with very few blown highlights or lost shadows. 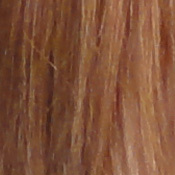 Overall color is very natural looking, if a touch warm. High resolution, 1,600 ~ 1,650 lines of strong detail. 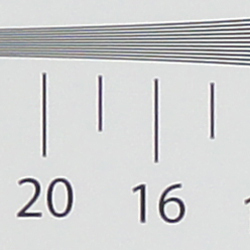 Our laboratory resolution chart revealed sharp, distinct line patterns down to about 1,650 lines per picture height in the horizontal direction, and about 1,600 lines in the vertical direction. (Some might argue for over 1,800 lines, but artifacts begin to appear at much lower resolutions.) Extinction of the pattern occurred around 2,200 to 2,300 lines in both directions. Sharpening is a little on the high side, though, leading to noticeable halos around elements of high contrast. Use these numbers to compare with other cameras of similar resolution, or use them to see just what higher resolution can mean in terms of potential detail. Images contain good detail, but are slightly oversharpened. Moderate noise suppression even at base ISO. 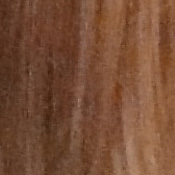 as in the darker parts of hair here. Sharpness. The Sony Cyber-shot HX5V is capable of capturing good detail, though definition of fine detail suffers a bit from the effects of noise suppression. 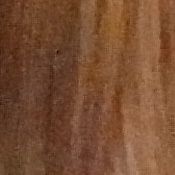 In high contrast areas, the camera produces visible edge enhancement artifacts. 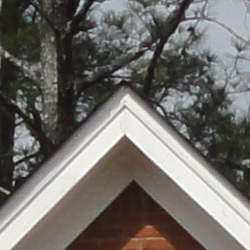 In the above left crop, "halos" can be seen around branches and along the edges of the white trim. Edge enhancement creates the illusion of sharpness by enhancing colors and tones right at the edge of a rapid transition in color or tone. Detail. The crop above right shows moderately high noise suppression, with the darker and low contrast areas of hair showing limited detail. Individual strands remain visible in the moderate shadows, but quickly lose definition. Noise-suppression systems in digital cameras tend to flatten-out detail in areas of subtle contrast. The effects can often be seen in shots of human hair, where the individual strands are lost and an almost "watercolor" look appears. Effects of noise reduction already evident at base ISO, and noise suppression becomes fairly strong at the higher settings. 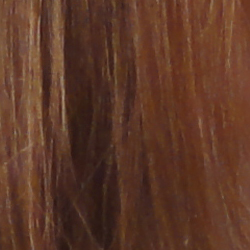 The Sony Cyber-shot HX5V applies a moderate amount of noise reduction even at the lowest ISOs, resulting in somewhat smeared detail in the mannequin's hair at ISO 125. ISO 200 shows a touch more noise than ISO 125, but detail is about the same. More detail is lost due to noise reduction at ISO 400, but results are about average for a compact long-zoom digicam (compare to Canon SX200 and Panasonic ZS7). At ISO 800 and above, additional detail is lost and chroma noise becomes more noticeable, especially in the shadows. At ISOs 1,600 and 3,200, chroma noise in the form of yellow blotches is quite evident, and fine detail is all but gone, smoothed away by noise reduction. On-screen crops like this tell you only part of the story with a camera, though: To see how these images held up when printing at various sizes, read the Output Quality section below. High resolution with very good detail and dynamic range. Very good low-light performance. Sunlight. The Sony Cyber-shot HX5V responded very well to the deliberately harsh lighting in the test above. Both highlight and shadow detail are much better than average for a compact camera. Exposure was very good too, as we preferred the image with no exposure compensation added. (Most cameras require a +0.7 EV boost in exposure to render the model's face bright enough in this harsh lighting, but the HX5V did not.) Still, you might want to consider using a fill flash in situations like the one shown above; and it's better to shoot in the shade when possible. The above images show the effect of the Sony HX5V's face detection in full Auto mode. The HX5V did adjust the tone curve so that the model's face and shadows are a bit brighter than with Program mode, yet highlight and shadow retention is slightly better. It's interesting that the exposure time, aperture and ISO are identical, which means the apparent increase in brightness is due to image processing alone. Very nice performance. Low light. The Sony Cyber-shot HX5V performed well on the low-light tests. Though the images above are a bit dim, exposure compensation or manual exposure mode can easily address that. While the HX5V's maximum exposure time in Program Auto is only one second, and two seconds in iAuto, the camera's maximum exposure time is 30 seconds in manual exposure mode. That would allow it to easy capture bright images down to the lowest light level we normally test at, which is 1/16 foot-candle. Noise is well controlled up to ISO 800 for a compact camera. Automatic white balance looks pretty good, too. The HX5V's Hand-held Twilight mode is a feature that helps eliminate the need for a tripod in low-light conditions. It automatically takes six shots in a fraction of a second at high ISO (ISO 1,000 in the example above left), and combines them into one image, averaging out much of the noise. While Hand-held Twilight only required 1/8 second shutter speed, the Twilight scene mode (above right) required one second at ISO 125, which is too slow to hand-hold. As you can see, the Hand-held Twilight mode shot isn't nearly as noisy as you'd expect for such a high ISO in a compact camera, though we should note that these shots were taken on a tripod, while HHT mode is intended to be used handheld. The camera's AF system was able to focus down to about the 1/2 foot-candle light level unassisted, which isn't as good as some compacts. In an unusual twist, enabling AF assist didn't help low-light autofocus in our tests. In fact, the camera required a bit more light to focus with AF assist enabled, as the assist beam seemed to overwhelm the AF system. Fairly weak flash. Our standard flash shot required an increase in ISO or slower shutter speed to produce reasonably bright results. Coverage. Flash coverage was a bit uneven at wide-angle (but not bad, given the wider-than-average 25mm equivalent focal length). 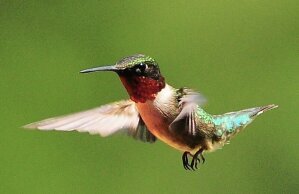 Coverage is more uniform at telephoto, but the range isn't powerful enough for full telephoto in our test. Exposure. In the Indoor test, the Sony Cyber-shot HX5V's flash underexposed our subject even with maximum flash exposure compensation boost of +1.0 EV. (The average needed for this shot is +0.7 EV). The camera's Slow-Sync flash mode produced a good exposure with only +0.3 EV boost, with the usual warm cast from the background lighting. The camera's Auto mode boosted ISO to 250, but resulted in an image that was still a bit dim. 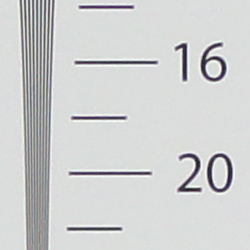 ISO 125 Range. At wide-angle and ISO 125, flash shots started out a bit dim at 6 feet, becoming gradually dimmer from there. At telephoto, flash shots were quite dim already at 6 feet, becoming quite dark at farther distances. Unfortunately, an all too common outcome for a compact camera. Manufacturer Specified Flash Test. In both the wide-angle and telephoto shots above, the Sony HX5V's flash appears to perform to specification at the rated distances, producing bright, properly exposed images. However, the camera had to boost ISO to 800 to achieve those results in both cases. Our standard test method for flash range uses a fixed setting of ISO 100, to provide a fair basis of comparison between cameras. We've now also begun shooting two shots using the manufacturer-specified camera settings, at the range the company claims for the camera, to assess the validity of the specific claims. Good print quality at 13x19 inches. ISO 400 images are soft but usable at 11x14, ISO 800 shots are better at 8x10. Printed results from the Sony HX5V are good, handling enlargement up to 13x19 inches at the lowest ISO settings, though with some noticeable softness due to overaggressive noise suppression at ISO 125 (the lowest setting). 11x14-inch prints look better at both 125 and 200. ISO 400 also looks good at 11x14, but with a little more softening in low contrast areas. ISO 800 shots are soft but usable at 8x10, and ISO 1,600 shots look good at 5x7 inches. ISO 3,200 produces a quite good 4x6, with good color and decent shadows. While it's an overall good performance from the Sony HX5V, it's a little disappointing when you consider the promise of its back-illuminated sensor. Because the magic of the Sony HX5V is found in modes like Handheld Twilight, we also printed a sample of our Low Light test shots shot in that mode, adjusting levels because our HHT shots were a bit dim, and prints looked good printed up to 11x14 inches. The images above were taken from our standardized test shots. For a collection of more pictorial photos, see our Sony Cyber-shot DSC-HX5V Photo Gallery . Not sure which camera to buy? Let your eyes be the ultimate judge! Visit our Comparometer(tm) to compare images from the Sony Cyber-shot DSC-HX5V with those from other cameras you may be considering. The proof is in the pictures, so let your own eyes decide which you like best!